Diamonds may be a girl’s best friend. But these days, a girl could use more than one BFF — she needs a squad, or a tribe to empower her to be the best she can be. When it comes to jewellery, diamonds may be fabulous, but one’s collection is not complete without shiny accoutrements of other sorts — think blues sapphires and red rubies, tanzanites and tourmalines, padparadschas and amethysts, to name a few. But this month, we have our eyes on emeralds. It is, after all, the month of May, the birthstone of which is the emerald. What should you know about this precious gemstone before you go shopping for it or invest in it? Read on. 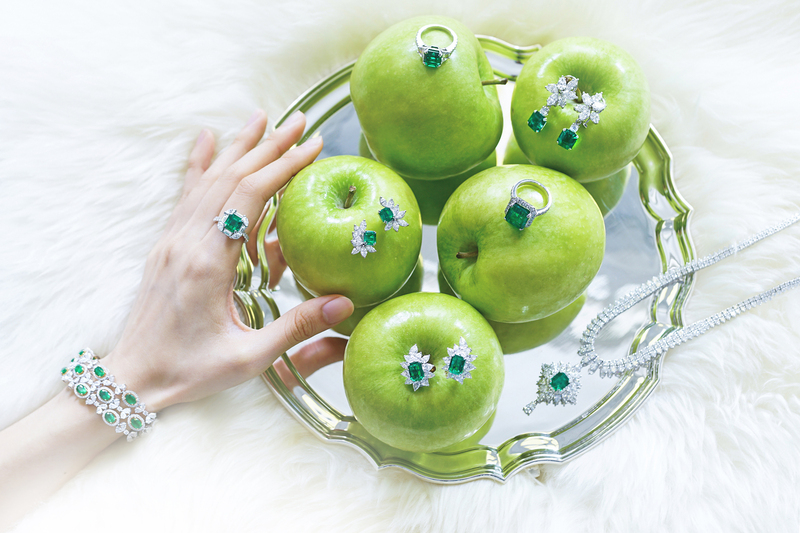 What are the essential factors one should consider when buying a piece of emerald jewellery? The origin of the emerald is an important factor to consider. Emeralds from Columbia are generally more sought after. This is generally due to the colour of the stones originating from that region, which has the best greens. Why? A lack of nitrogen in the stone is one reason. The stones that hail from Columbia also has more chromium, the chemical that makes emeralds green. There is also a particular mine in Muzo, Columbia, which produces the best of the best Colombian emeralds. This exceptional shade of green has even been coined by the industry as “Muzo Green”. For diamonds, there are the 4 Cs. For emeralds, what should one look out for to ensure its quality? First, look out for its colour. It should have a dark, vivid green tone, but not too dark that the stone appears black. Next, there is the oiling of the stone. This is usually categorised from “no-oil”, “insignificant” and “minor” to “moderate”. Anything below moderate is not worth considering. The quality of the cut is another factor to consider. The stone should possess a sparkle from within the stone, bringing to stone to life. It should not be too shallow, which compromises the colour and makes the stone look too transparent and lifeless. Finally, compare the surface area of the stone to its carat weight. It should look its size instead of appearing smaller than its carat weight especially when the stone has more depth. Are emeralds worth investing in? Most definitely, especially the ones that checks these boxes: No Oil, they come from Muzo Mines and have the Muzo Green hue. These stones are extremely rare and appreciates tremendously because of this rarity. 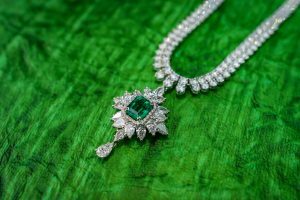 How should one take care of their emerald jewellery? Emeralds are a softer gemstone compared to others, so extra care is needed when you wear it. Be careful not to knock them against hard surfaces. 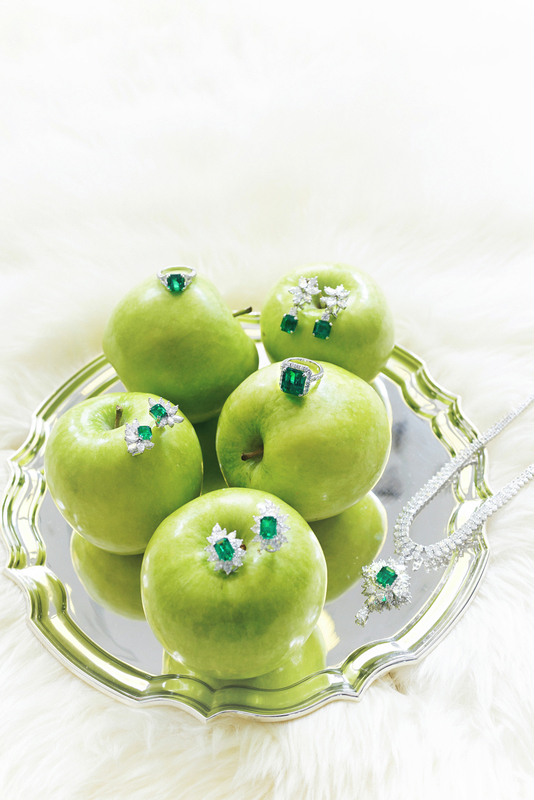 Always keep emerald jewellery separately in a box, or preferably in its own box. Never clean emeralds in ultra sonic jewellery cleaners — instead, bring them back to your jeweller for professional cleaning. What is one thing about emeralds that many people may not know about? Emeralds a a lot rarer than diamonds. What type of metal or setting are ideal with emeralds? White gold is perfect for emeralds. Setting-wise, it’s best to pavé the main emerald stone with smaller side stones. Is there such a thing as the ideal cut for an emerald stone? No. The cut is a matter of personal preference. The colour is the main factor to look out for when you’re buying emeralds.